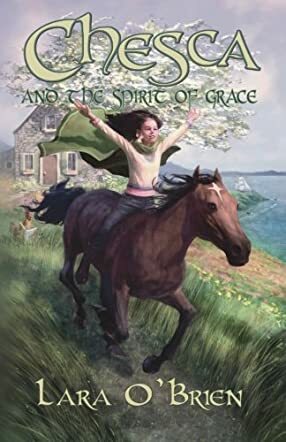 Chesca and the Spirit of Grace is written by Lara O’Brien. Chesca is happy living on the farm with her Ma and Da and beloved farm animals who can talk. She has a special relationship with them, especially her pet mouse. When her mother is hospitalized, snobbish Aunt Dena comes to stay with her and tries to get Chesca to do things she dislikes. Aunt Dena hates farming and Chesca’s father, who owes bank loans. She devises a plot to trick her brother-in-law into selling the farm to developers so she can make money. Chesca discovers her aunt’s scheme and decides to put on a show to raise money to save the farm. She intends to ride Malley, her father’s wild stallion in the show, while performing as Grace O’Malley, Ireland’s famed Pirate Queen. Chesca knows it won’t be easy organizing a show while trying to save the farm, but she will do everything in her power to thwart her self-centred aunt. Chesca and the Spirit of Grace is a delightful book filled with a touch of magic. Lara O’Brien’s characters, mainly Chesca and her precious animal friends, are so likeable. I admire Chesca’s lively personality and her stubborn determination to accomplish things, even when they are difficult ones. It was also interesting to see how Ma’s illness affects each family member and how they cope with it. The author writes very nicely and imaginatively. I know preteens, particularly girls, will also find her story very enjoyable. Thank you for such a sweet review.